Mt. Blue boys look to get healthy, stay consistent. 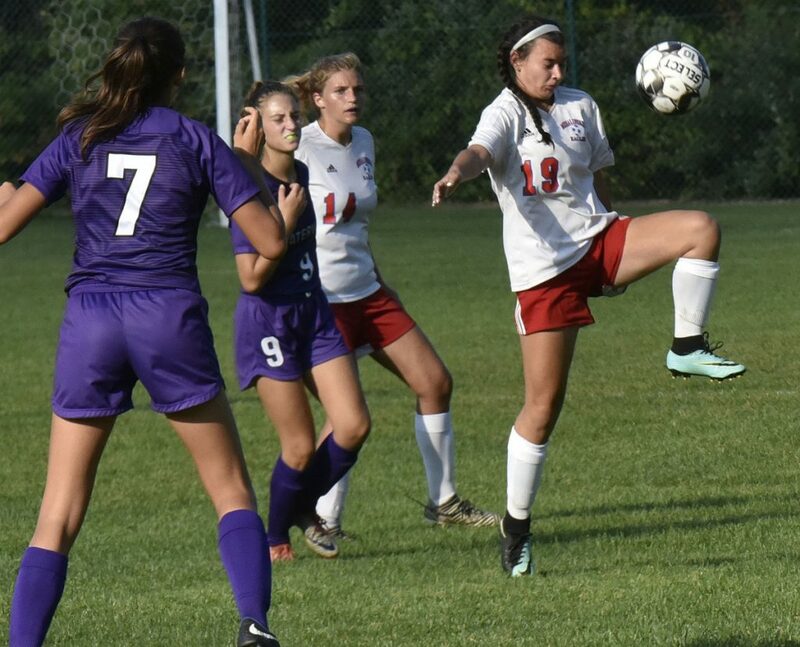 The Messalonskee girls soccer team is unbeaten in five straight (5-1-0 overall) after a season-opening loss to powerhouse Camden Hills, and the Eagles are starting to form an identity that likely could spell trouble for their competition. It’s often said that a good offense is the best defense, and Messalonskee is locking opponents into its own half of the pitch with alarming regularity. Keeping that type of patience with — and without — the ball can be trying at times, said Eagle senior Caitlin Parks. And Parks is one of the engines in the Messalonskee attack, with her ability to control play from out on the right flank. She can go to the goal herself, or more often than not, find senior Anika Elias — who scored five goals in a win over Waterville Tuesday — to finish off plays. The Mt. Blue boys have just one loss this season, but the middle stages of the campaign haven’t been without some trying times. A rash of illnesses and injuries popped up, forcing Mt. Blue to limp to a pair of 1-0 wins over Cony and Hampden Academy, two teams well outside the Class A North playoff structure. It finally caught up to the Cougars in a 3-1 loss at Maranacook on Tuesday. There is still plenty to like about the Cougars, who boast a potent attack in senior striker Sam Smith and a very good back four. Maranacook coach Don Beckwith praised Mt. Blue for what it brings and believes it’s a team that could make a second consecutive deep run in the postseason. Though it’s not been the best stretch for the Cougars, who reached the regional semifinals last season, Smith is keeping things in perspective. The Mount View boys sit atop the Class B North standings with a 7-0-0 mark following Wednesday’s 5-1 win over Brewer. The Mustangs are the only team in the 21-team region without a loss or a tie on their record. … After going winless through their first four games, the Skowhegan girls have won two in a row — including an overtime victory against Oxford Hills — to climb into the Class A North playoff structure. … After winning six straight to begin the year, the Mt. Abram girls are 6-2-0 and occupied the top spot in Class C South as of Wednesday night. … There is a logjam atop the Class C South boys region, with No. 1 Maranacook (6-0-0), No. 2 Hall-Dale (5-0-0) and No. 3 Mt. Abram (5-0-0) all unbeaten through Wednesday. They’ve conceded just six goals combined across their 16 games.